Roscoe’s next to a KFC. Chicken and waffles. For people that are not familiar with this tasty combo they always think I’m CRAZY when I crave for it. It’s very hard to come by in NYC but I found that more and more restaurants are serving this perfect combo-ness of hm….deliciousness. Pies ‘n’ Thighs have it for their brunch but last time I had it, it was just not the same. Maybe because they hipsterfied it by serving you buckwheat waffles. WTH?! 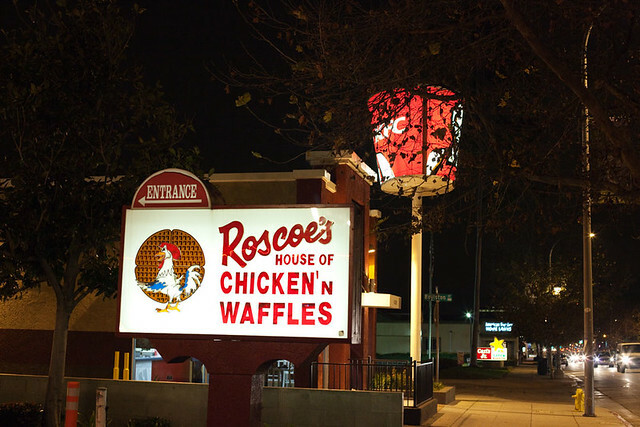 Well growing up in LA you know that fried chicken and waffles are amazing together and you know there’s only 1 place to go for it, Roscoe’s! 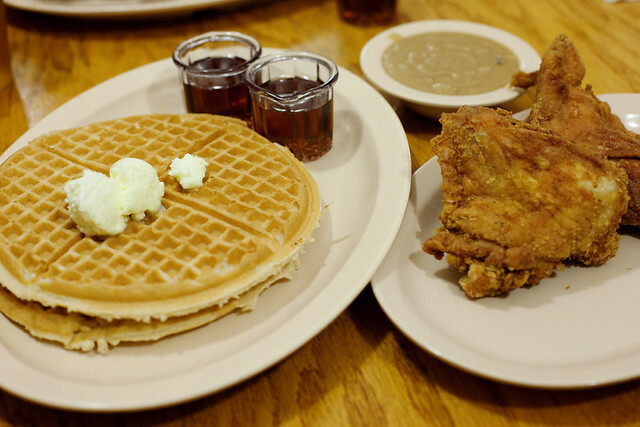 Roscoe’s has pretty much become part of LA, an institution, that for me Roscoe’s = chicken and waffles. It’s been a while since I had a meal at Roscoe’s, looking through the menu it seemed quite foreign. I just wanted some tasty waffles and some tasty fried chicken. I ended up getting their Combo #2, 1/2 chicken smothered with gravy & onions and 2 waffles. Hey but guess what, I was able to swap out the 1/2 chicken with 2 thighs. Take a look at these beauties. Man those waffles, I ain’t in NY anymore. Those waffles were to the extreme! Light and fluffy, smear some butter and drizzle syrup all over. Of course you can’t JUST eat the waffles, you have to eat it with the perfectly fried yet juicy chicken. May I also suggest adding some gravy to the mix. Sweet, buttery, salty, fried-y, gravy-y…hhhmmmmmm amazing. Ok ok I may be exaggerating here a bit but it was just so damn good and actually way too much food. Next time 1 waffle is enough and make sure to get the gravy on the side so you can taste the fried chicken by itself and also have the gravy to dip everything into. The gravy is goooood.